On March 15th I sowed two batches of Beta vulgaris subsp. vulgaris – Swiss Chard ‘five colours’ – in coir pellets; two seeds (or rather, seed clusters, as per beetroot and other member of the Beta family) per pellet. One batch of six pellets was put into an unheated mini-propagator unit in our (also unheated) greenhouse. The temperature will have fluctuated from around 2°C at night to temporary peaks of 34°C during the day (memo to self: check auto-vents are working…) with a probable average of about 14°C to 18°C. As you can see, the heated propagator seedlings have romped away, having germinated in only three days, to the point where they’re probably a little too vigorous and leggy, but hopefully not etiolated. By contrast, the unheated seeds have only just started to break the surface, although there’s a good chance more of them have put out their radicle (initial root) and are on the cusp of putting up their cotyledons (seed leaves). I’m going to move the germinated seedlings into the greenhouse, where the dull weather that’s set for the next few days should slow them down a little and hopefully encourage them to grow more steadily. I’ll also thin them out to the two strongest specimens per pellet and let them fight it out from there, otherwise there’s a risk that they’ll all compete each other to death. Winner will take all eventually, with one plant per pellet remaining to be potted on. One thing I’ve learned over the last few years of growing: there’s no point being sentimental about seedlings, if you want strong plants for cropping. The other batch will remain out in their unheated propagator unit as well. Either they’ll catch up eventually or they’ll lag behind a bit, which won’t be a bad thing from a crop succession point-of-view. It all goes to show the difference that a steady, reasonably high temperature makes when it comes to germinating seeds. 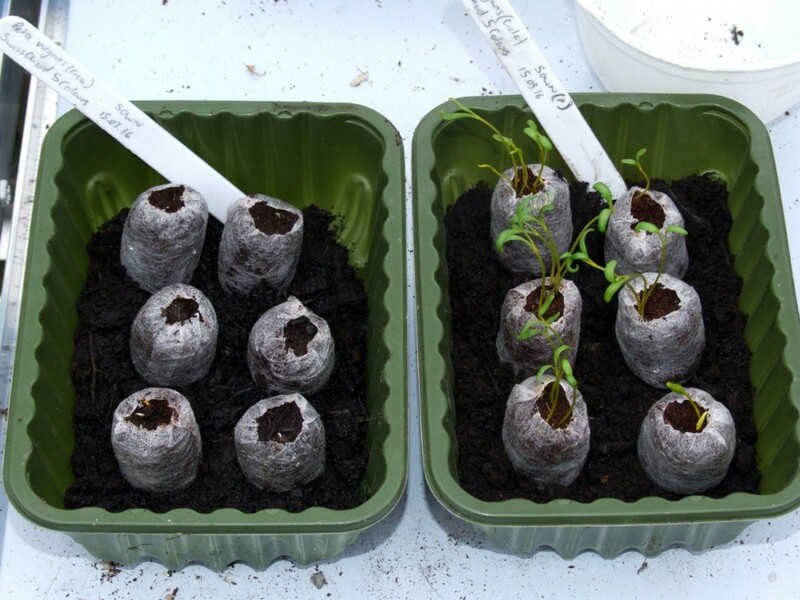 Of course, whether it’s worth using a heated propagator – taking electricity consumption and associated environmental factors into account – just to bring on a few early seeds, is a matter for debate and conscience. Picking berries is a full time job st this time of year isn’t it?